The years spanning the crash of the stock market in 1929 to the outbreak of World War II in 1939 were some of the most troubled, fascinating and, at times, even lively, that the world has ever known. They were also, despite the immense hardships faced by many, some of the most fashionable and at that point in time, the design houses and clothing companies of France still held major sway over what the world sported. While, of course, many people could scarcely survive - let alone think about keeping up the the Jonses on the fashion front - for those who were fortunate to still find themselves in a middle class or higher income bracket, the world of style carried on, by and large, much as it had for not only decades, but centuries before. New names emerged, vying sometimes with well established favourites. Trends came and went with the seasons, hemlines - much like the infamous stock market itself - bounced from high to low and back again over and over, and certain looks would emerge and forever cement themselves as the defining styles of that decade. The gorgeously illustrated book, A Decade of French Fashion, 1929-1938: From the Depression to the Brink of War from Dover Publications does a marvelous job of highlighting some of the most engaging and stylish looks of the nine - ten years between the end of era that brought us The Bright Young Things and six years of indescribable horror, as WW2 tore like wildfire though huge portions of the globe. This was a period of glitz and glamour on the fashion front, where talkies entered the picture in Hollywood and movie stars – and what they wore – began to take on a status akin to that, traditionally, held only for royalty. It was time of uncertainty and excitement. Elements of the now often said expression "you only live once" remained from the party filled heydays of the 1920s, yet they were tempered with a more sophisticated refinement and serious air in the uncertain days of the thirties. In A Decade of French Fashion, 1929-1938: From the Depression to the Brink of War, readers are presented with a splendidly detailed array of fashions from the era as they first appeared from the leading clothing designers of France at the time. Save for a lovely written introduction, there is exceedingly little text in this 112 page soft cover book (which was released by Dover in July 2015). Instead the spotlight is shone - as I'm certain many a 1930s fashionista and starlet alike would approve of - on the clothing of the era itself. Such is presented through a well curated bevy of full-colour illustrations that first appeared in the pages of French catalogs which were geared towards especially towards the international market. From the lingering notes of 1920s trends (think drop waists, handkerchief hems, cloche hats, etc) to the strikingly different styles that saw many a woman through the start of the second World War, such as hemlines that hit just below the knees, bold shoulder pads, and waistlines at one's natural waist, a flip through this book instantly highlights many of the trends, creative ideas, and beautiful details that called 1930s fashion home. Being so devoid of text, this elegant book can be enjoyed in one quick sitting, though many a vintage and historical costume fan will want to savour it for far longer that - and both will find it to be indispensable in furthering their knowledge of, and appreciation for, looks from the third decade of the twentieth century. From chic daytime ensembles (including that sort that you just know 1930s ladies who lunch were sporting en masse) to jaw dropping evening looks, the styles presented in this delightful book span the last breaths of the flapper era to the softer, and yet at the same time, also more rigid styles that would set the tone for fashion well into the mid-1940s. This is a book to read and time and time again, each new viewing helping further details - from button placements to hemline shapes - to present themselves to you, the reader, as you soak up and savour the supreme elegance that was 1930s fashion for those with the means to buy from the best that France had to offer. Though I myself rarely wear looks from this period (most, especially those before 1937, are anything but becoming on my short, hourglass shaped figure), I appreciate them immensely and have a strong affinity for all things art deco era fashion related. Thus, it was with no small amount of pleasure that I readily, and happily, accepted Dover's wonderfully kind offer to both receive a copy of A Decade of French Fashion, 1929-1938: From the Depression to the Brink of War to review here, as well the opportunity to give one lucky Chronically Vintage winner the chance to win their own copy of this fabulous vintage fashion resource. Read on to find out how you can win! 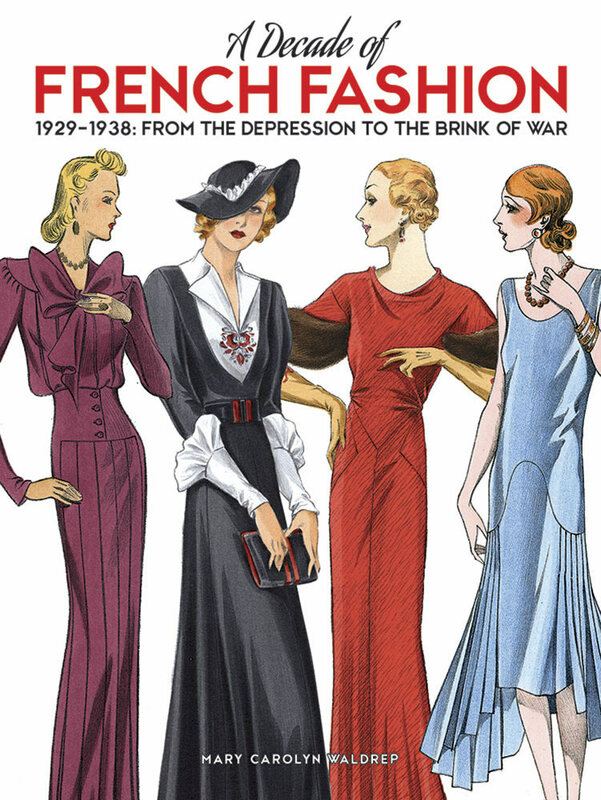 This giveaway is for one copy of the soft cover book A Decade of French Fashion, 1929-1938: From the Depression to the Brink of War from Dover Publications. It is open to readers (participants) worldwide and will run from today's date (Monday April 25, 2016) until 11:59 PST on Wednesday May 4, 2016. The winning name will be drawn using Rafflecopter's random winner tool once the giveaway has wrapped up and the winner will be contacted via email shortly thereafter. Your book itself will be shipped out to you directly from the fine folks at Dover Publications. You may enter using however many of the following ten Rafflecopter methods you desire. The only entry that is mandatory is that you please leave a comment on this post in which you share with me one or more of your favourite elements of 1930s fashion. The more ways that you enter, the greater your odds of winning become. If you have any questions about this book giveaway, please don't hesitate to email me anytime. There was, and will forever be, an unmistakable sophistication and understated beauty to 1930s fashion. It took its inspiration from countless sources and culminated in a streamlined, refined style that could be blazingly minimalist or enchantingly whimsical. Very often it fell somewhere in between, with lengthy lines, bias cuts, and all sorts of marvelous details – that still make fashion lovers say "oh-la-la" to this day – calling the looks of this decade home. I feel fortunate to be able to add A Decade of French Fashions, 1929 - 1938 to my collection, as well as to be able to offer one lucky winner a copy of their own, and want to sincerely thank Dover Publications for another exciting and very generous collaboration. My thanks all go out to each and every one of you as well, who take part in this exciting vintage fashion book giveaway. A lovely looking book! There is something so classic and elegant about the 1930s. I really enjoy the details of the cut and construction of this time period. The thing that I love about 30s is the seam lines and style lines are never boring. There are dozens of examples of skirts with the same silhouette and length -- but they are all different, whether there's little button tabs, or pockets, or a pointed yoke, etc. This reminds me of a book I have of French Art Deco Fashion of the 20's. My favorite fashion period. Beautiful pictures. The women always look impossibly thin in these drawings! But I love the silhouettes. My favorite thing about 30s fashions is the creativity displayed in the necklines/yokes/collars. I think that scarcity drove the designers to new heights of ingenuity. Oh, boy. I just love soaking in the fashions of the 1930's and 1940's. I think one of my favorite things about 1930's fashion was the sophistication of the styles. So many dresses exuded feminine details, but many also included details in the seam lines that are just amazing. Why use a straight seam when a zig zag would suffice? Forgive me if this is double-posted, just as I hit "publish" on my comment, my internet went out. Ack! I loooooooove Dover publications! I would love a copy of this one, I think it would be a favorite. My favorite part of 1930s fashion is the inventiveness and experimentation with silhouettes, necklines, and other details. There's something about the 1930s that says "creative, but refined." I love bias cuts popular in the 30s and the capes & hats! But bias gowns are always my top vintage fav. After years of thinking 30s style was not for me, I have finally found that it really is! I think it's got a reputation for being slightly dowdy or unfitted but the more I find out about the styling and the cutting and the finishing, and high quality of the hand-made items from this decade then the more I love it. I have a very exquisite silk blouse from the mid 30s which I think is my all time favourite, I think I may have to blog about it and include a link to this if I get some time before the competition ends. Thanks for the chance to enter, the book looks great ! Gorgeous outfits! Sounds like a fun book! Oh my word, I hope I win this giveaway! By the way, this is such a looovely book and I not only adore history, but fashion history is always great! I remember visiting the Imperial War Museum in London... at first I didn't want to go, because it's about war... but finally I decided to go, after some years :) and I saw things about fashion too, there. They asked women to be creative and they were. Lack of fabrics and so on, and they had to recycle, to create, to embroider, it was a DIY decade, for sure. I loved it, and I will love this book! Hope you are fine, dear Jessica and having a nice week! Oooh this looks like fun! Oh my goodness!!! Vintage French fashion. I am about to swoon! So I'll just mention one: curves came back into fashion. Though I adore 20's fashion, nothing makes me feel girlish more than a flattering waistline. What a gorgeous-looking book and a lovely prize. When I think of 30s clothes, I probably think first of Ginger Rogers movies. I love every single outfit in the 1937 Ginger Rogers/Katherine Hepburn movie 'Stage Door' - lots of long chiffony evening dresses but cute tea dresses, puffed-sleeved blouses and skirt suits too. How wonderful! This would certainly fill a gap in my current library. Thank you! I really love the intricacies of cut involved in bias cut gowns and other fashions from this time. They look so simple, but I know they're not. I love the gorgeous Jean Harlow -style bias cut dresses! She also wore some fabulous pants when she was out playing golf. Now that I think about it, Hepburn and Detrich wore some great pants, too. Maybe that's my favorite! I love the silhouette of 30's style fashion. I love how feminist the style was then! Wow this book looks fantastic! What I love most about the 1930's is the bias cut. It was an amazing period of developing and exploring different looks with fabric on bias which then lend to more in the way of pattern making and draping in fashion. I think this is a great giveaway! I feel that one of my favorite elements of 30s fashion is the structure and patterns. The work that went into creating a piece and how it was made to look so effortlessly beautiful... Swoon worthy! My favourite feature of 1930's fashion is the inventive use of bias cut: ruffles, flowing gowns, and flared skirts! This book seems so interesting and fascinating!